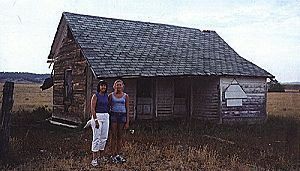 We're at the HF Bar Dude Ranch (307/684-2487) outside Buffalo, Wyoming, a treat of Grandma Hastings, who didn't want us to 'lose Wyoming'. It occupies 9,000 acres in Saddlestring and operates as a working ranch year-round, welcoming guests in private cabins from June till October. As my mother-in-law promised, after 70 years in business, they certainly know how to entertain everyone. There are morning trail rides, picnics and barbecues, fishing, hunting, a big pool and lots of activities for the girls. I had an incredible visit to Sheridan, WY, my dad's birthplace. The new owners of his home were on the porch and took us through. Their grandparents bought it from the last Selway in the 1920s and they've lived here ever since. The second floor was three apartments during the Depression, but now is filled with four grandchildren. Also, I finally met the great grandson of the man who drove my grandfather's sheep off a cliff on December 31, 1902. It was part of the cattlemen/sheepmen's war and quite a scandal, only solved when a cowhand broke down and confessed in 1964 in Montana Quarterly.